High on my bucket list – but never achievable – was the country of Romania. While living in Bulgaria, I tried to make it to Romania. You’d be surprise how difficult it is getting between the capital cities of Sofia and Bucharest! Thus, when I saw tickets for less than 100 Euros round trip (for both me and the Prince! ), I snatched them up and off we went for a (long) weekend road trip through Transylvania. Out of all the places we visited, Sibiu was the biggest and best surprise! 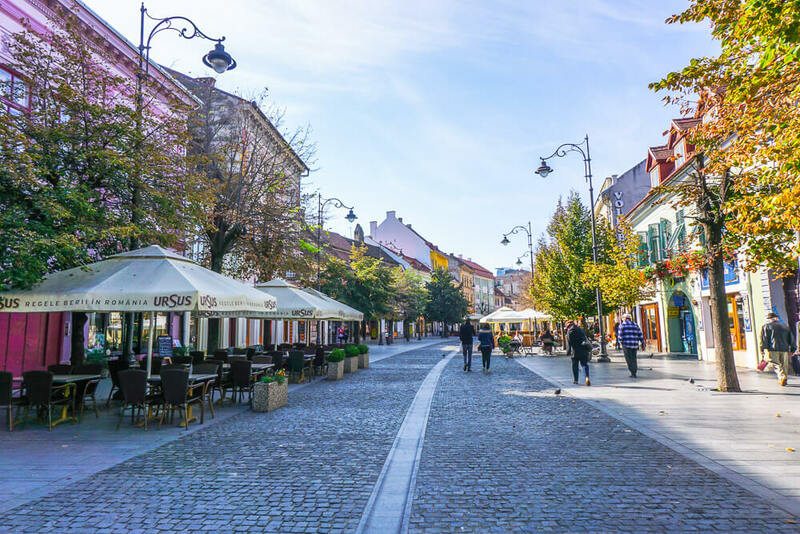 Here are some our favorite things to do in Sibiu, Romania along with basic information to help your trip run smoothly! Upon arriving in Sibiu, the Prince and I were shocked by the German influences all around the city! The city actually has an alternative German name – Hermannstadt (English: Hermann’s City). The city was founded in the 12th century by German settlers and continues to embrace its German culture (most notably through the architecture, German-written daily newspaper, and German festivals). Due to the settlers coming primary from the German region of Saxony, the seat of Universitas Saxorum (Community of Saxons) was based in Sibiu starting in the 1400s. The Universitas Saxorum organized the political and legal entities in Transylvania. Up until the 1570s, the city was part of the Kingdom of Hungary. From 1570-1683, the city was part of the Principality of Transylvania, a semi-autonomous region of the Ottoman Empire. After the Habsburgs gained control of the region in 1683, the city stayed under Austrian rule for almost 200 years until it became part of the Austro-Hungarian Empire in 1867. Sibiu didn’t become part of Romania until after World War I. Even then, the city was still primarily German and it would stay a German majority until 1941. Between the 1950s and 1990s, around 95% of the German population resettled back in Germany (they were entitled to German citizenship). There are now around 2,000 Germans in Sibiu and 14,000 Germans in Transylvania, down from around 250,000 in the early 20th century. Regardless, the German minority party is still quite influencial in Romanian politics and the current President of Romania, Klaus Iohannis, is ethnically German. Sibiu was named the European Capital of Culture in 2007 (along with Luxembourg City). This designation reinvented the entire city – ushering new life into Sibiu through events, festivals, renovations, and tourists. It also introduced a traditional German Christmas market to the city that same year, the first of its kind in Romania. Additionally, the Old Town of area of Sibiu was named the “8th-idyllic place to live in Europe” by Forbes Magazine in 2008. In 2019, Sibiu will be one of Europe’s Gastronomy Capital Cities (along with Kuopio, Findland). In additional to a multitude of awards, Sibiu is in the process of applying for the Old Town to become a UNESCO World Heritage Site. Getting to Sibiu is not the easiest due to its location in Transylvania and Romania as well as the poor public transportation infrastructure in the country. The Prince and I used a car to get around Transylvania. Without a car, we would have been very limited in what we could have seen. We flew into Bucharest, the capital city, and rented a car to take us to Sibiu. Although the route is less than 300 kilometers, it took a full day (with a couple stops) to reach Sibiu. Thankfully, my friend Karen (she also gave us our hotel recommendation along with some food/coffee recommendations!) had mentioned the horrible driving conditions and frequent traffic jams beforehand so we were well prepared! Driving conditions are actually quite decent in Romania – the biggest issue is the lack of roads. There is usually only one way to get to a city and one way to leave (think: no shortcuts and bypasses). Additionally, these roads run straight through the middle of towns/villages so you’re never going fast at all! However, the scenery was absolutely stunning between the farmland and soaring mountains. If you’re going to use public transportation in Eastern Europe, definitely rely on buses. Although the journey time is longer (about 6 hours from Bucharest to Sibiu), I actually find buses to be reliable and comfortable! There are loads of bus companies heading between the two cities (and multiple other cities in Romania) – a quick Google search will guide you in the right direction. First and foremost, take in the stunning architecture and colors of Sibiu. Between the cobblestone streets, outdoor cafes, main squares, and colorful architecture, the city leaves no doubt that it was heavily influenced by Germans. With only a day in the city, the Prince and I had to be quite efficient in what we did in Sibiu and what we saw in Sibiu! Thankfully, Sibiu’s Old Town is quite contained and easy to explore in 24 hours. Start your day by heading to Piata Mare, the main square of Sibiu. This has been the center of the city since the 15th century. During our evening stroll through the city, the Prince and I stumbled across the city’s Oktoberfest with easily a few thousand people present (and half a liter of beer for less than 2 Euros!). This square is also home to the Catholic church of the city as well as many cafes and restaurants. Lined with cafe, restaurants, and an abundance of history, Piata Mica is home to the Old Town Hall as well multiple museums. Make sure to walk over Podul Minciunilor (Bridge of Lies) before taking the street Strada Ocnei down to the Lower Town. Built in the 13th century, this tower connects Piata Mare to Piata Mica. Climb to the top of it for gorgeous views of the entire city. Throughout its history, the tower has been used as a gate tower, a grain deposit, a prison, a museum, a guard for the Old Town Hall, and now for exhibitions. Cutting between the Old Town of Sibiu, make sure to walk down Strada Nicolae Balcescu, the main pedestrian street of Old Town Sibiu. Lining this street are many outdoor cafes and restaurants as well as some of the most renown (and colorful!) architecture in the entire city. The old Austro-Hungarian influences are clearly seen in the details on these buildings as most of the buildings date back to the 18th and 19th century. Located in Brukenthal Palace, a gorgeous Baroque-style palace on Piata Mare, is Brukenthal National Museum. The palace used to be home to Samuel von Brukenthal, the Habsburg governor of Transylvania in the 1790s. The palace opened as an art gallery in 1817, making it the oldest museum in Romania. There are over 1,200 pieces of European artwork from the 15th to 18th century. There is also a library inside the palace with over 300,000 pieces of literature. Biserica Evanghelică din Sibiu, Sibiu’s Lutheran Cathedral, is located in Piata Huet (Huet Square). Piata Huet is the third main square in Sibiu’s Old Town (the other two are Piata Mare and Piata Mica). While construction started on the church in 1350, it was only completed in 1520. For almost 300 years, it was the burial site of Sibiu’s elite, royalty, and political figures. While this was banned in the late 1790s, an exception was made for Samuel von Brukenthal in 1803. The four turrets on top of the steeple indicated to civilians that the death penalty was practiced in the city. The steeple is actually the highest tower in all of Transylvania and gives the best views of the entire city. Additionally, the church’s treasury is thought to be one of the most valuable in all of Europe. One of the most well-known baroque style churches in Transylvania, Biserica Sfânta Treime (Church of the Holy Trinity) is listed as a historical monument by Romania’s Ministry of Culture and Religious Affairs. One of the focal points on Piata Mare, the church was built in the 1720s and is the longest active Catholic church in Sibiu. While unassuming from the outside, the church is intricately painted and detailed inside. Only a little more than 100 years old, Catedrala Sfânta Treime din Sibiu (Holy Trinity Orthodox Cathedral) was inspired by the Hagia Sophia in Istanbul, Turkey. The Prince and I actually walked by this cathedral exactly as a service was ending (mass exodus of people)! The interior paintings of the cathedral were done in a neo-Byzantine style although they’ve undergone changes in the past 100 years, most notably in the 1950s. The cathedral was designed by Hungarian architects and the dome was completed in Munich. Located in Piata Mica on the way down to Sibiu’s Lower Town, the Podul Minciunilor (Bridge of Lies) has been a staple of folklore and stories for hundreds of years. Legend says the bridge has ears and knows when someone standing on the bridge is lying or being untruthful. Lying is indicated through creaking and other noises from the bridge. Pasajul Aurarilor (Goldsmiths’ Passage) is a set of steps in Piata Mica that take one between the Upper Town of Sibiu and Lower Town of Sibiu. This passageway has some of the oldest buildings in the entire city with many dating back to the 14th century. Get lost in the side streets of Sibiu’s Lower Town. This area is one of the oldest in all of Sibiu and is home to many secret squares, hidden passageways, narrow streets, and colorful buildings. Definitely check out the buildings and architecture in this section of the city. A heavily fortified city, Sibiu has been a defensive post since the 13th century. Over a period of two centuries, four levels of complex and sophisticated fortifications were built as well as channels, ponds, and floodgates installed. The street Strada Cetatii best illustrates the fortification system and towers from the medieval ages. Along this street is a well-preserved stretch of wall as well as three towers – Turnul Archebuzierilor (Archers’ Tower), Turnul Olarilor (Potters’ Tower) and Turnul Dulgherilor (Carpenters’ Tower). These towers were named after the three guilds responsible for defending them. The next two biggest cities from Sibiu are Brasov and Cluj, both about 2.5 hours away. The cities are of cultural importance and easily reachable by car. As an added bonus in Brasov, make sure to visit the three most notable castles in/near the city – Peles Castle, Bran Castle (Dracula Castle), and Cetatea Rasnov (Rasnov Fortres). Only 1.5 hours from Sibiu, Sighișoara is another city founded by German settlers. With a population of around 30,000 (compared to Sibiu’s 150,000), it is a much smaller alternative to Sibiu. The colorful streets and stunning architecture in Sighișoara’s Old Town have already been designated a UNESCO World Heritage Site. Additionally, the city was one of the most important transit routes in Transylvania for several centuries. Located right outside of Sibiu in the Transylvanian Alps, the Făgăraș Mountains are an adventure lover’s paradise. The mountains are home to many year-round outdoor activities including hiking, cycling, and skiing. As the oldest ski resort in Romania (founded in 1894), Păltiniș ski resort is one of the premier ski resorts in the region. Although the downhill routes are limited, there is extensive cross-country skiing infrastructure. The most important events and festivals to occur in Sibiu include the International Theater Festival in mid-June, Oktoberfest in the end of September/beginning of October, and the German Christmas Market in December. The city also hosts a popular Artmania Rock Festival the beginning of June. A recommendation from Karen, the Prince and I got one of the best lattes of our life from Arhiva de Ceai si Cafea. Between the cosy ambiance, friendly staff, and reasonable prices, this is a must-stop place in Sibiu. Make sure to try their homemade cakes as well! Cafeneaua din Librarie literally translates to “Coffee Shop in the Library.” As a huge book reader myself, this coffee shop is located in Habitus Library. There’s no better place to curl up with a good book and a delicious coffee! A little bit of Austrian in Sibiu, Café Wien not only serves traditional Austrian coffees and desserts but is located in the middle of Old Town Sibiu. It has a lovely outdoor terrace that overlooks the Lower Town of Sibiu. Another recommendation from Karen, Crama Sibiana prides itself on fantastic traditional Romanian food. Located in an underground cellar, this just makes the ambiance of the entire restaurant even cozier. I’d highly recommend the goulash in a bread bowl…heavenly! While it is primarily a wine cellar, Weinkeller also serves local Romanian cuisine. This romantic restaurant is the perfect place for date night. In the summertime, the cellar opens up to terrace seating that leads right to Lower Town Sibiu. Located right in the middle of Old Town Sibiu, Smart Hostel has a wide array of private rooms and shared dorms. Additionally, a free breakfast is included in the price of the rooms and dorms. It is one of the highest-ranked hostels in the entire city. Although located in Old Town Sibiu, Hostel PanGeea is conveniently situated on a side street (thus minimizing noise issues). The hostel also has an absolutely fantastic bar. Once again, Hostel PanGeea has both private rooms and shared dorms. A cozy bed and breakfast in one of Sibiu’s best locations, Goldsmith is one of the highest-rated properties in the entire city. While the parking can be a bit difficult to find in this area and breakfast is an additional charge, the bed and breakfast is nevertheless one of the fineset properties in Sibiu. The Prince and I stayed at Casa Veche when we were visiting Sibiu and it was one of our favorite hotel experiences. Besides the fact that the room was comfortable and breakfast was delicious, the owner went out of her way to make us feel welcomed and accommodated. While the property is right outside the Old Town area (a 5-minute walk), it is both quiet and parking is readily available. Casa Hermanni is a clean, fresh, beautiful-looking hotel located in Old Town Sibiu. Some rooms even feature a balcony or terrace that overlooks the Old Town! The lightness and airiness of the rooms extend to the colorful cobblestone streets right outside the proprety. Located right on Strada Nicolae Balcescu, the main street of Old Town Sibiu, Hotel Imparatul Romanilor has been documented since 1555. After the Habsburg Emperor Joseph II went to Sibiu while on tour through Transylvania in 1783, the hotel was renamed in his honor. While the original building was demolished in 1891, the new building was opened at almost the same location in 1895. The Prince and I had an absolutely wonderful time in Sibiu. We were both pleasantly surprised at how welcoming the citizens were of Sibiu – everyone wanted to help us and ensure that we had the best time ever. Our only regret is not spending more than 24 hours in the city. There are still so many more things to do in Sibiu, Romania, and I’m convinced this isn’t our last time back to visit! This post might contain affiliate links at no additional cost to you! Sibiu is beautiful! You’ll definitely have to go back and spend more time in that area. I know very little about this region of the world and enjoy learning the history now. I’m actually reading a book right now that takes place in Transylvania and Wallachia in the 1400s and I honestly didn’t even know before some Googling that Wallachia had ever even been a real place. I have a lot to learn! Keep traveling to these places and sharing what you learn there with us. I want to go to Romania so bad! And now I can add Sibiu to my list of places I want to go there. What a great, helpful, detailed post. Can’t wait to visit!!! Thank you for introducing me to Sibiu. My husband really wants to go to Romania, but we just haven’t yet. I love the colorful houses and architecture! So charming! It’s been so long since I went to Sibiu. I used to drive there for a long weekend with my friends back when I was a teenager. It’s one of the coolest cities in Romania and one very close to my heart. Really love this post, very detailed, very beautiful pictures. Hi, Jordan. Thank you for your lovely take on Sibiu. You are right about the trains. Sadly, I wouldn’t recommend them to anyone. As for some of the attractions, I would also recommend the ASTRA open-air museum is also worth a visit and for day trips, the Brukenthal Palace in the town of Agnita. Oh wow, I’ve never heard of this place before. And have never really been interested in visiting Romania, but this really piqued my interest!